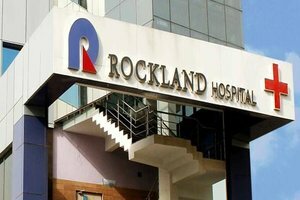 VPS Rockland Hospital, the first multi-super specialty hospital located in the industrial township of Manesar, conducted a critical and miraculous surgery, where a factory worker’s hand was replanted in a nine hour crucial and intensive operation. A 20 year old boy got his hand amputated while working in the factory at Manesar and was profusely bleeding when bought to the hospital. The patient’s hand was completely severed at the level of wrist (Transcarpal amputation). It was then that a team of six doctors from VPS Rockland Hospital led by Dr. Pradeep Singh, Chief plastic and cosmetic surgeon initiated the process of this miraculous surgery, operating on the patient throughout the night to achieve the miraculous replant of the hand. The team of doctors at VPS Rockland Hospital first stabilized the hand with the help of wires. After this, a repair of the vessels was done to provide the blood flow to the tissues followed by repair of tendons and then all the common digital nerves. The surgery which lasted nine hours ended successful with the team of doctors saving the hand of the patient and replanting it back. “Patient’s vessels were repaired immediately to provide blood flow to tissues. It was followed by repair of tendons and common digital nerves of each finger. The patient was kept under supervision for four days and then discharged,” Dr Pradeep Kumar, head plastic surgeon, VPS Rockland Hospital-Manesar said. Patient was kept in observation five days and then discharged in a satisfactory condition. Complete recovery took around three months.